an old schwinn cycletruck up for sale!!!!!! I have the opportunity to purchase a mens 26'' Rollfast. Its missing its headlight and truss rods, and possibly a tank and rear rack. It's a straightbar, and has scrapes suggesting a tank was there originally. Burgandy and cream, its really in nice shape. The problem?...my wife...and you know the rest. If I can convince her it's a good deal, I might get away with buying it. Oh, it also has the brace across the handlebars. What's a good price? I know what he wants, and its reasonable(It would match a womans I have that fully equipped) but I need extra voices! Sorry for the ignorance but I'm just starting out and would appreciate any help at all. I have a rough Schwinn to restore. What is it middle weight,light weight??? It has 26 X 1 3/4 tires. Single speed rear hub. The serial number on the back is R37234. Thanks you very much for any help or references!!! That serial on rear dropout indicates 1956. Middleweight is the term used for that tire size. Ain't nothing light about it. Here are two pre-1957 serial #'s in which may help you to determine the exact year of your Schwinn: R01452-R99999 from 1955, or R25623-R38316 from 1956. Good luck! 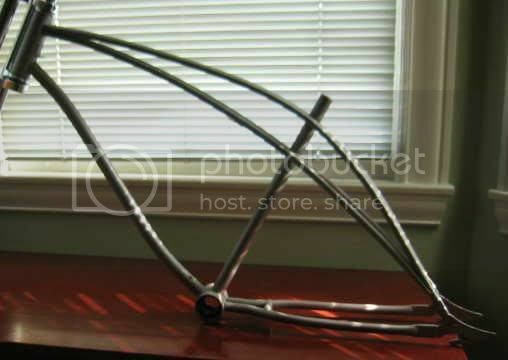 Would really like some help trying to ID this frame that I have. It is interesting because the backbone is actually four trusses. Two on top and two bellow. The dropouts are unique in shape as well. I have tried going through the photo archive here, but it is very large. Any help is greatly apreciated. I just picked up one of those myself last month! Thank You so much Rif. Someone else I met on another forum will be happy to know as well. They picked one up too LOL. They certainly are unique, the backbone reminds me of the G.G. Bridge where I live. That's so cool, I'm finaly glad to know what it is. Thanks again. just glad to help out. I tucked mine away in storage (along with all my other parts/projects) until I can finish a few of the current projects. Is this the tank with two bulbs in front of the steering tube? If so, one wire from the light goes to the front of the battery tray and the other wire connects to the switch. There should be a wire or connector from the rear of the tray to the other side of the switch. Probably takes two "C" batteries, but I've seen some with "D" also. Whatever fits.